Vegan mode is a setting that you can turn on and off. You could also do /gamerule veganmode. When vegan mode is on it makes it so you can not kill passive mobs. Hostile mobs that drop meat will not drop meat anymore. Also, you would not be able to make stuff withe chicken eggs. The only use for chicken eggs would be to hatch chickens. Vegan mode would provide a challenge for players who are getting bored of Minecraft. Vegan mode would also be good if you wanted to play Minecraft and you are vegan. Also, you cannot get meat from trades with villagers and there will never be meat in any chests you find in any structures. While the idea of vegan mode may be interesting for some people. It is very niche for it to demand an entire separate gamemode/rule/whatever. One can simply do this by manipulating the game's loot table. Should one special interset be accomidated, fairness would demand that all recieve equal treatment (and there are a great many things I would rather MS/Mj spend resources fixing). If this "When vegan mode is on it makes it so you can not kill passive mobs." includes by environmental damage (eg a thoughtfully placed lava bucket or carefully positioned skeleton), a lag issue could easily arise as chickens are hatched/ passive mobs bred with no way of descreasing the numbers. There is also no mention of non-meat drops. If you don't want to eat meat don't eat. You don't need to stuff it in gamemode nobody will turn on. Whilst I do respect and accept vegans for their choices in life based on their ethical principles. I don't think real world topics involving ideology, religion, politics (identity or otherwise) should be brought into this game. If Minecraft were more like the game Eco based around a certain narrative (as in this case environmental issues) than okay. But MC is pretty much an open sandbox game with no real age restriction played by all kinds of people. I'm not a religious person, but I have never asked to remove temples from the game just because I myself do not adhere to any belief and I definately won't even suggest something that could be seen as an infringement on other peoples experience/playstyle with the game. So basically: Being Vegan is okay. Adding veganism into a game as a feature would just bring up questions as to "why not add ideology X as a gamemode as well?". If you want to have an extra challenge to the game- or just play vegan because you are vegan- do it yourself. There is no need to implement a "vegan mode" when you can just choose to not kill passive mobs and instead only eat crops. This mode is redundant. Vegans don't need a special mode catering to them. If you don't want to eat meat, then don't kill animals. PETA mode is not needed. How is veganism PETA lol. As for the OP, I see no real reason to add this. If you don't want to eat meat ingame, then don't. Simple as that. I'm pretty sure he means PETA-like because they are advocating for veganism quite often. However bashing vegans or equating them to PETA is a bit mean. There are quite a lot of vegans (I would even say a majority) who despise PETA... strangely enough for animal cruelty of all things. But anyways... better to go back to the actual topic at hand and not be stuck on unrelated political stuff. The idea was to implement a challenge mode of sorts and food just happens to be one way of doing it (though it got out of hand in the end). On of the problems with MC is that it takes next to no real effort to aquire foodstuffs. Seriously... I is really hard to starve to death in MC. So maybe work on a difficulty setting that tweaks drop rates or tick times for crops to grow... maybe even change the potency of bonemeal? Maybe even go as far as suggesting a minigame server were potatoes are the only thing eadible (just a placeholder) and call it "Spud Wars" (yeah I know... dumb name... also a placeholder). Either way there are a myriad ways of implementing a challenging idea using you approach without rubbing people the wrong way and sorry if I sounded harsh. I wasn't trying to sound hostile per se. There is no need for something like this. Just don't use the items. It is as simple as that. I live life according to veganism but am actually against introducing a vegan mode. I think creating a vegan mode as suggested in the OP further emphasizes the misconception of veganism as an identity. It is very common for people to misunderstand it, both those calling themselves vegans and those who do not. I would instead suggest keeping the choices open to how to behave in the game, just like in real life. I think it is more important to encourage people to find out what is true on their own, to avoid pointing fingers or painting things black or white. To understand veganism, let's investigate a bit. To start with, it is not a diet. It is a movement which aims to show how life on this planet is a phenomenon to be treasured, revered and respected where animals (including humans) are not 'the enemy' to be subdued, materials for food, fabric or fun that were put on Earth for a particular use. This perspective of compassion aligns with the ethics and morals common to most if not all members of humanity as well as those most modern societies claim to uphold. In theory. But as to this date, less so in practice. If we are not ok with killing a human or a dog, why are we ok with killing other sentient beings? In current legal practice (even if when the law does not allow it!) it is allowed to torture and kill one species of animal, but not another when people make decisions based on cultural and traditional bias. But cultures, people and society and legal practice can and do evolve, as we have seen through history. I can also give a perspective from my experience as an activist showing slaughterhouse footage to people on the street during weekends where I notice that people are simply disconnected from what animals are going through. Even passersby making jokes about what is shown, like by saying 'mmm bacon/mm hamburger' when they see a cow or a pig getting their throat slit, or 'mm chicken nuggets' when they see male chicks sent into macerators in egg farms, do not really mean what they say, but throw out jokes as a defense mechanism. As children, we are taught to love animals and were we to meet a cow, a pig, a hen or a chicken in person we would probably like to befriend them. We would never want to actually hurt or treat the animals in the way they are in modern factory farms. There is a cognitive dissonance pervading society when it comes to food and clothing, since the connection between what is on a plate or in a jacket or a pair of boots and what has happened before it became a that commodity is not shown by the companies involved in its production. Humanity today does not need to consume animal products for survival, there are alternatives already invented to replace basically all the most popular common foods made with animal ingredients as well as other products. Also, consider health. The currently most common cause of human death in the world according to the World Health Organization is ischaemic heart disease and stroke. These are caused by plaque build-up in the arteries from high cholesterol levels. Cholesterol levels are heightened by digesting meat, dairy, egg and refined plant oils (saturated fats). So, veganism is not about faith like religion, it is about making consistent choices, aligning facts with ethics. It is about asking ourselves what kind of world do we want to live in, putting aside all concepts derived from culture, ideology, religion, tradition and so on. Introducing a vegan mode from this perspective would thus not open up to arbitrary faithbased modes as some posters suggested. But neither am I am sure such a mode would be congruent with the one described by the OP. So, as I stated initially, I think it would be would be better left out. Instead I would prefer that the game made more room for choices aligned with veganism. I would prefer if there were more options added to the game so that one could better access all parts of it without being forced to kill animals or mobs, while still leaving everyone who wants to have it as before free to play it that way. Not only those calling themselves vegans who would enjoy playing in a peaceful way, and think this amazing game known as Minecraft should be open to as many as possible. I looked a bit into vegan mod packs such as this one: https://minecraft.curseforge.com/projects/vegan-life. It might have some ideas for options which could be introduced into the vanilla version. I tried to install it, but on my current setup I cannot even get Forge to run without crashing. Either way, I prefer staying in vanilla over using mods. I have played Minecraft since alpha and always looked forward to and enjoyed exploring the latest versions of the game as they come out. Charcoal as an alternative to black dye and ink. A plant-fiber as an alternative in recipes using wool. I always loved using item frames, paintings, banners and all sorts of colored items in creative ways for decoration, but lately, I feel a bit limited playing more and more in a peaceful/vegan way. One can create 'wool' by turning cobwebs in abandoned mineshafts into strings, but I think it is unfairly cumbersome. Many plant materials traditionally used for cloth are suitable candidates, such as cotton, hemp or linen (from flax). My preferred choice would be hemp, a plant which has been cultivated for cloth for at least 10,000 years which is naturally resistant to bacteria, mold and heat. It also have a low water requirement. I would like to see a set of colored clothes in Minecraft which are not armor. I don't think bamboo qualifies to replace wool. Modern soft bamboo textiles are very chemical heavy and produced in a way similar to synthetic fibers and thus don't fit very well in Minecraft. But, a bamboo-fiber could be a replacement for leather. This would enable peaceful players to make books and item frames which I think most would agree are pretty essential for nice builds, bases and making game progress. Bamboo also works for new items like baskets, hats and shoes similar to the traditional ones in China and Japan. The composter which is coming in version 1.14 could yield different types of fertilizers depending on the materials composted. Bonemeal from plants does not make sense. 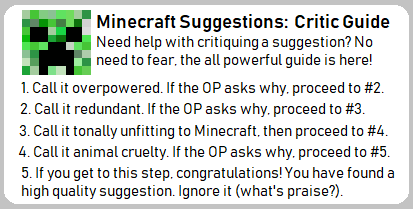 It would also be great to have ways of gaining XP to repair and enchant high-level tools other than making large mob-farms. If I have missed some peaceful efficient way of getting XP, please let me know, but in my survival world at the moment I'm out of luck, especially with mending being so hard to get without an AFK automated fish farm. Even if I love automation with my background of engineering studies coupled with work experience in software development and greenhouse irrigation systems I still prefer building stuff like doorways, music circuits, minecart and transport systems over traps and killing chambers solely for XP, and I think fish farms could be said to belong to these latter two categories. A suggestion not directly related to the topic: Podzol could be craftable from dirt and some sort of humus derived from the compost, this would align well with the composts podzol-like appearance! I think having several paths along the main survival game progression would make the game more fun and diverse and appeal to more people. Add a hard to craft suit and/or equippable item that would make mobs no longer attack unless you are carrying a weapon and instead be open for trade. It could be made by combining rare materials encouraging exploring, such as from emeralds, lapis lazuli, packed ice, prismarine and sunflowers. Obtaining the suit could also enable befriending the ender dragon, to achieve permanent access to the end in a peaceful manner. Maybe by giving the dragon a sufficient amount of loot; diamond and/or obsidian blocks, or perhaps by completing some type of quest. The dragon head would of course not be obtained in this way, but perhaps the egg? Add a peaceful entity to summon as an alternative to obtaining a beacon. Personally I think a UFO would be quite hilarious, since the beacon is essentially a pyramid, it would be a subtle reference to all the conspiracy theories about aliens and pyramids. It would make sense since the beacon seems quite high-tech. It would be a neat challenge idea, but it definitely doesn't warrant it's own gamemode in the slightest. No support. @AvionPhoton nice read which pretty much sums it up and... those ideas sound interesting as well. Thank you, I will see if I have time myself, otherwise any of the ideas are of course up for anyone to propose, spread and use! This suggestion would be good but the immense struggle it would cause. Wool would require you to first get shears. Animals could get stuck in your house or glitch out and you can do nothing. Leather would be almost impossible to get. The game would be waiting, waiting for crops to grow, waiting to find crops by killing zombies, tilling dirt or destroying grass, constantley walking for a village for beetroots, having to go find a jungle for melons, waiting for saplings to grow, destroying like 10 trees to get 3 apples. The base idea is good, but needs to be further explained or simplified. This challange could be done normally in normal minecraft, not to mention some vegans are fine with killing animals in games. How would you get ink sacs, leather, meat to feed dogs, remember that's a thing, humans are vegan wolfs aren't. Ok let me make this clear... I am not Vegan or even vegetarian but I can understand why someone would be. But vegans in MINECRAFT... A VIDEO GAME?!?!?! That's just stupid... animals in Minecraft are not living things they are simply lines of code in a PC. I can't believe society has gotten to the point people are trying to protect lines of code like this my goodness hahaha. Like no offence but this is the worst idea I have ever heard. The boundaries between real-life and lines of code are not as clear as we'd like to think, if we sit down and examine them a bit. In fact, from a certain perspective, humans and other animals are the most advanced robots ever constructed, or, a more accurate description might be; self-assembled from/with the environment. Pretty cool I think! At a larger scale, people buy into and enroll in programs; cultural, educational, social and so on, built and maintained by mostly unchallenged shared collective thought-structures. If we look more closely, since everything was thus once taught, there is nothing that really says what a thing in our direct experience truly is. Taken to its conclusion, any statement about an object or action in existence boils down to holding a certain idea as truer than any other, even if it is never absolutely true and thus ultimately arbitrary. It's just a different v. - the idea - from MC "L(ive )A(ction )R(ole)P(laying." If such a thing - conceptually, now - exists. Pro's. : exercise; In Real Life, interaction (and /or "face-time," even and-beyond not-even comm'n. methods, sometimes anymore "of 'comm'n. '"). Con's. : more - note point above is genesis of this idea - food required; more-interactive with Reality. Vegan mode is a setting that you can turn on and off. You could also do /gamerule veganmode. Yeah, I thought so. We'll get to why this is a terrible idea in the conclusion, but first I need to... squelmber (?) through the rest of the post. When vegan mode is on it makes it so you can not kill passive mobs. So... pigs, chickens, and rabbits are as useless as polar bears. Nice? Hostile mobs that drop meat will not drop meat anymore. Well I mean... This is probably the least objectionable change since eating the flesh of long-dead humans and long-undead pig people seems like something I would enjoy. Except for the fact that I don't really care because it's a sprite I shove up my blocky nose in order to fill a timer. Also, you would not be able to make stuff withe chicken eggs. Which removes Pumpkin Pies and Cakes, and without Rabbit Stew, there are practically no more complicated foods. The only use for chicken eggs would be to hatch chickens. Vegan mode would provide a challenge for players who are getting bored of Minecraft. I wouldn't call switching out the items required to replenish the hunger timer a "challenge", considering you practically have to intentionally avoid getting seeds for a wheat farm on accident. Once you've grown more than about twenty or thirty wheat plants, the amount of seeds is enough to have enough bread before the next crop grows. The only issue is that because of how little bread heals your saturation, you'll have to eat more repeatedly than you would with meat. This makes combat annoying, to say the least. Vegan mode would also be good if you wanted to play Minecraft and you are vegan. Also, you cannot get meat from trades with villagers and there will never be meat in any chests you find in any structures. So in conclusion, you've taken a configuration system built into Minecraft to remove items that offend you, more specifically a configuration system meant for stopping systems that are usually put into place for server owners (setting mobGriefing and fireTick to false is useful on Creative Servers.) or map makers. Now that we've taken a system implemented into the game for a specific purpose and used it for some kind of inclusivity virtue signal stunt act of compassion and diversity to force onto people in your server since gamerules are server-wide, what have we earned? Well, flipping on the gamerule removes a large part of gameplay, turns previously useful animals into purely ambient mobs (even though one rarely sees wild pigs, cows or sheep, so it seems very odd seeing these things wandering around in a non-farm situation) and only a small portion of people would actually get some purely emotional use out of it. All of this and I still haven't yet mentioned the fact that we're talking about coloring a blocky animal-resembling 3D model red and watching it rotate so that it looks like it falls over, then a blocky item that slightly resembles meat appears. On the non-graphical side, we're talking about deleting a table from a larger table that stores chunk data. The game simulates an "animal" by running likely less than a thousand lines of code to make the animal pick a block to pathfind towards.